Investors are increasingly aware of the opportunities in developing regions around the world. The focus on the BRIC countries - Brazil, Russia, India and China (the acronym was introduced by Goldman Sach's Jim O'Neill in a 2001 paper entitled "The World Needs Better Economic BRICs") addressed the shift in global economic power toward the developing world. Growth drivers include a large market opportunity, coupled with the growth of a large, youthful and increasing affluent population that needs improved physical infrastructure, better health services, and a broader array of consumer goods. In addition, these countries are significant players as both global importers and exporters of a broad array of products and services. A broader view of the developing market opportunity should be considered which includes Argentina, Chile, Colombia, Czech Republic, Egypt, Hong Kong, Hungary, Indonesia, Jordan, Malaysia, Mexico, Morocco, Peru, Philippines, Poland, Saudi Arabia, Singapore, South Africa, South Korea, Taiwan, Thailand and Turkey among others. This past week, Bloomberg News noted that billionaire investor Sam Zell's Equity International unit is increasing its focus on Mexican and Colombian real-estate firms. At the same time, Financial Times columnist Martin Wolf highlighted the cautionary comments from Chinese premier Wen Jiabao who stated, "In the case of China, there is a lack of balance, co-ordination and sustainability in economic development." Wolf 's concern is that "The longer rebalancing is postponed, the more painful the adjustment will be. The Chinese economy of two decades from now will have to be vastly less investment-driven than the one of today. How smoothly and how soon will it get there? These are huge questions." MY TAKE: While there is a mantra of "buy emerging markets", investors should not lose focus on the need to understand the business drivers, valuation and risks associated with potential investments. Understanding the maturing and stability of the investment environment in each region is also important. This week, as a brief primer, I am sharing several charts which compare the per capita gross domestic product (GDP), population and population density for the largest (by population) economic regions globally; along with the International Finance Corp's Investor Protection Index ratings which measures the strength of shareholder protection from asset misuse by directors. In the coming weeks, I look forward to expanding this discussion with you. As structural changes are reshaping the global economy, significant changes are taking place among investors about their strategies as well. Driving these changes are 1) concerns about persistent equity market volatility 2) how lower economic growth may limit the potential for stock price appreciation, 3) the impact of declining interest rates on investment portfolios and 4) the potential for increase risk aversion as many investors move toward retirement. In an environment where investors are interested in "what CAN you do for me?" rather that "what MIGHT you do for me?" investments that provide hard cash to shareholders in the form of dividend payouts has increased appeal. To provide additional context to the dividend yield topic, please consider the following: as of Friday's market close, 104 of S&P 500 stocks in the US provided a dividend yield of 3% or higher, and 9 companies provided a yield of 6% or higher. In Europe, 246 companies in the DJ STOXX 600 provided dividend yield above 3%, 54 were above 6% with the highest providing an annual yield of 15.5%. When reviewing a universe of publicly traded limited partnerships and real estate investment trusts (REITS) in the US, there are 140 with an annual dividend yield greater than 3%, 68 above 6% and the highest provided a yield of 18.9%. MY TAKE: As treasury yields have dropped into record low territory, stocks with a dividend yield of 3% or higher, provide an interesting investment alternative. In addition, as cash has increased on many corporate balance sheets, some companies which have historically been reserved about providing a dividend, such as Cisco Systems (US: CSCO), are moving in this direction as well. It is important to understand that investments options are never without risk. While providing a dividend payout is generally a sign of a strong company, the investment should be assessed on both the potential future dividend yield and the safety of the principal (the price of the stock). When considering high dividend yield investment ideas, an understanding of both a company's financial health and its capacity to pay dividends over a long period of time are important. A track record of consistent or improving earnings and free cash flow growth should be helpful tools in assessing the quality and potential risks related to these investments. Trading ranges, trend breaks, the new normal and understanding valuation risk. 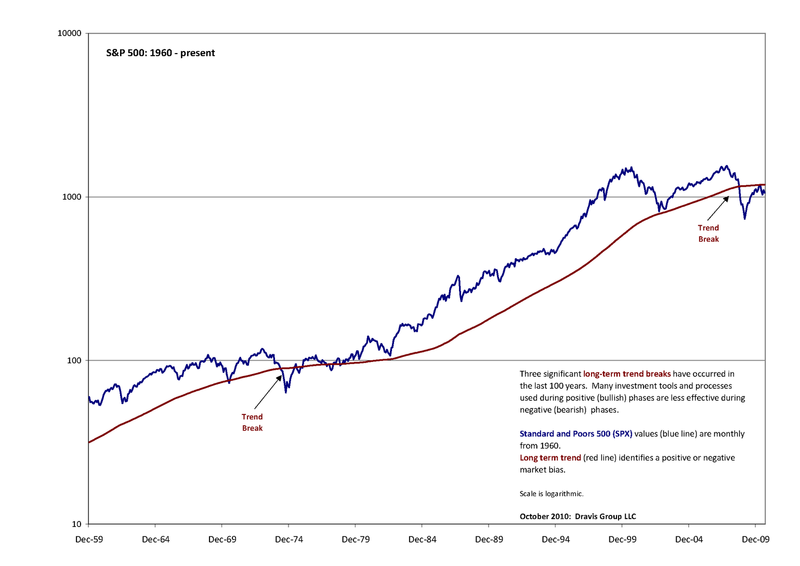 The long-term bull market that began in the early 1980s and concluded in 2007 provided a very “equities-friendly” environment for many investors. More recently, the market reversal toward the end of April and the “trading range” trap where asset prices swing up and down from week to week has been frustrating. Investors focusing on fundamental company analysis are challenged by the strong influence of macro-economic issues such as sovereign debt, unemployment, housing and slowing economic growth. Against this backdrop, some pundits suggest that stocks should be purchased at current levels because they are cheap. MY TAKE: Over the long term, financial markets move through economic cycles that can have significantly different investment dynamics. It is important to understand how the risk profile can change when moving from a bullish to a bearish phase. Our current period, often referred to as "the New Normal" - a phrase popularized by Pimco’s CEO and co-chief investment Mohamed El-Erian, suggests an environment with lower investment returns, slower economic growth and higher than normal risk. Over the past 100 years, three major “trend breaks” have occurred in the US: during the 1930s, the 1970s and the current period. Chart 1 (see page 2) presents the performance of the S&P 500 since 1960 and highlights the two “trend breaks” during this period. Historically, significant economic changes trigger trend breaks. These breaks can alter investor’s views on how asset prices are valued along with their appetite for investment risk. While no two economic cycles are similar, it is helpful to understand how asset valuations have been affected in the past. For example, the average price to earning (P/E) ratio for the S&P 500 from 1960 to the present is 16.6. The high, during 1999, was 29.8 and the low, during 1980, was 6.9. 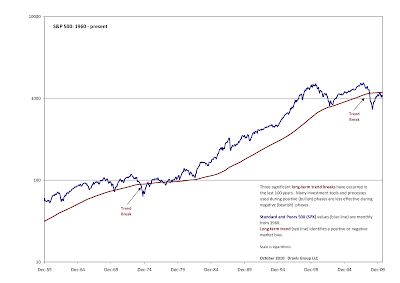 When a trend break occurred during the 1970s, the S&P 500 entered a twelve-year period during which the S&P 500 traded in a P/E range of between 7 and 13. At Friday’s close, the S&P 500 traded at a P/E of 14.6. Given the current level of economic uncertainty, bull market P/E ratios may not be a helpful guide. It is also likely that many of the investment tools and processes developed and used during positive (bullish) phases become less effective during negative (bearish) phases. My approach remains cautious and I continue to apply a process that focuses on managing risk and analyzes free cash flow yield dynamics. This past week, the Town of Westfield, located about 25 miles southwest of New York City, had its debt rating reduced by Moody's Investors Service to Aa2. This community has about 30,000 residents and a median family income twice the national average. Notable residents have included Charles Addams (cartoonist for The New Yorker magazine, and creator of The Addams Family), Butch Woolfolk (National Football League running back), Jeff Torborg (Major League Baseball player and manager), Kevin Kelly (founder of Wired magazine) and Robert Greifeld (CEO of NASDAQ). I grew up in this town during the 1960s and 1970s. It is an upper-middle class commuter town known for its good schools with good sports teams. Today, it faces challenges confronting many communities across the U.S. Its tax base has contracted. The State of New Jersey has placed limits on the town's ability to increase property-taxes. Now, as this suburan community struggles to meet its expense obligations, it has reduced municipal jobs. Bottom Line: We may be near the economic bottom of the financial crisis, but we are not out of the woods. Another week of cross-currents with 1) stronger economic data from China and Australia, 2) the Institute for Supply Management's index on U.S. manufacturing activity rose to 56.3 in August (expectations were for a decline to 53.2) and 3) while the US unemployment report on Friday was mixed, the results could be interpreted as "while not getting much better, it was not getting much worse". President Obama's comments on Friday presented his view of the situation in the US: "There's no quick fix for this recession. The hard truth is that it took years to create our current economic problems, and it will take more time than any of us would like to repair the damage." MY TAKE: Investors have significantly debated the potential for deflation, inflation, a double-dip or a "V" shaped recovery as they position their portfolios. However, what happens if we just end up with a "muddling-along" economy? If this is the case, some investors and money managers, in an attempt to generate positive returns, may move beyond their traditional comfort zone and extend the reach of their processes. Such approaches can lead to costly mistakes. In this environment, job number one remains "risk management".